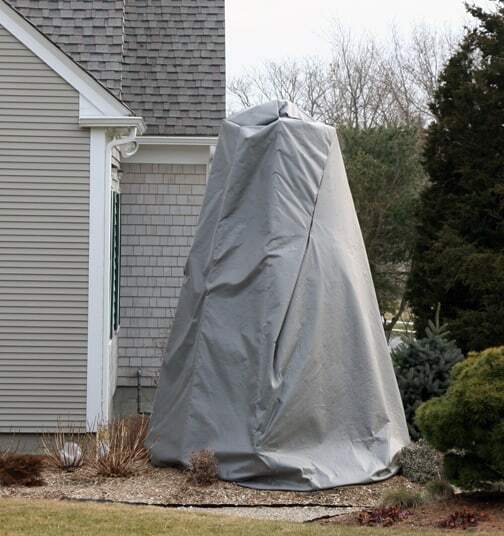 Yes, slip-covered shrubs and, oh dear, even trees get wrapped for the winter. The motive here is usually good. People want to protect their plants from cold and desiccation. The results of this desire for shelter are mixed at best. First of all, these plants are ugly, ugly, ugly. I don’t care if the burlap is dyed green or printed with faux foliage. Yuck. Secondly, if the fabric is touching the leaves this protection can actually cause harm. Burlap can wick moisture out of the foliage instead of protecting it. And finally, when a covering is used that doesn’t breath the plant inside will cook. That’s what happened to the large blue holly in this photograph. The tarp that was used acted as a greenhouse as the sun got stronger, causing the plant inside to heat up without being able to breathe. One could argue that this was pre-meditated murder, but I doubt that those who wrapped this plant knew that death was inevitable. Most people choose evergreens so that they can enjoy the foliage twelve months a year. So why are we covering up the very asset that dictated our choice of plants in the first place? And what are we so afraid of? Yes, the plant might get some sunscald or windburn in the cold season. Most plants recover from this by midsummer. Hard truth: we are so fortunate to be able to surround ourselves with plants chosen for beauty, not for sustenance. We do not depend on our landscaping for our food. So have the backbone, and the gratitude, to go with beauty with your entire being, and winter damage be damned. It was a blue holly and it was dead by March. Enough said.